Muddy colors are one of the biggest frustrations for my readers. In this post I will break down what muddy colors actually are and how you can avoid them in your paintings. The phrase muddy color is often used to describe grays, browns and other desaturated colors. You will frequently hear artists refer to a color as being "muddied" when it is desaturated, or refer to the conglomeration of colors on the palette after a long painting session as "mud". Muddy color is also used frequently used with negative connotations to describe a color we are not happy with as it appears wrong or out of place. This could be any color, not just gray or brown. 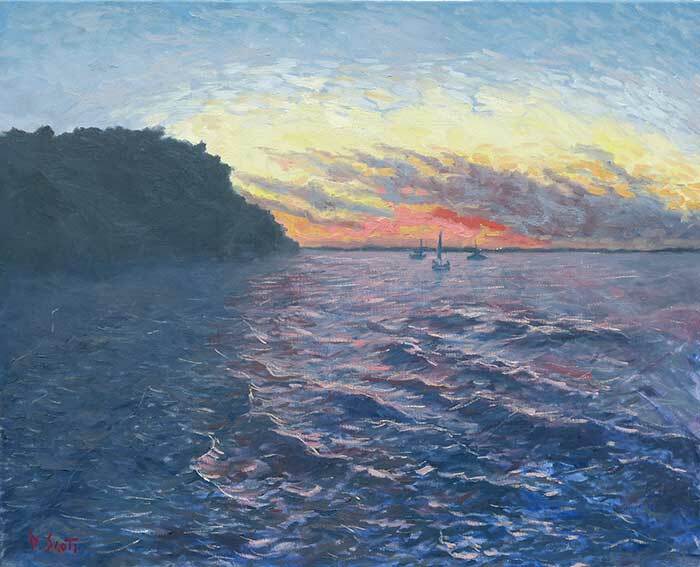 For example, if I were to have used more saturated blues in the painting below, those colors would probably look muddy as they would not make sense under the warm light of the sunset. 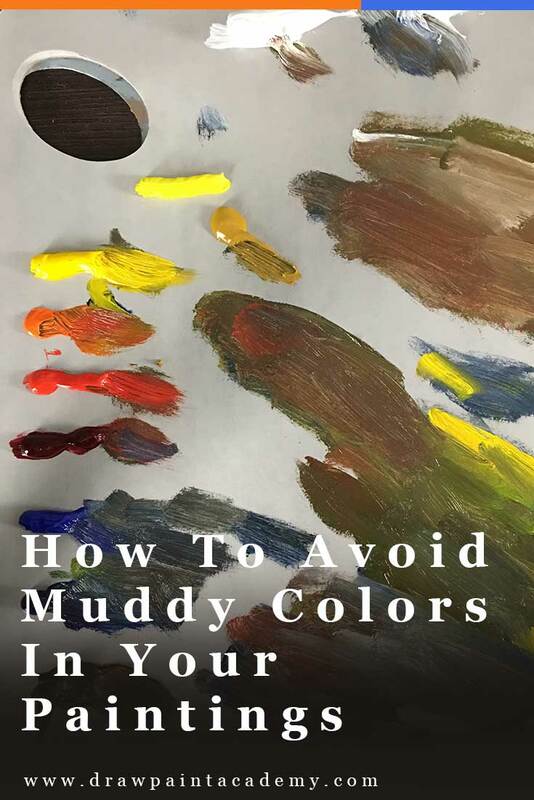 Many teachers will say that you must avoid muddy colors at all costs, without actually explaining what they mean by muddy color. They will tell you to keep all your colors pure, avoid mixing too many colors together and thoroughly clean your brush between strokes (or use different brushes) in an effort to prevent your colors from getting muddied. This is all sound advice (provided you don't take it too literally) but it may mislead you into thinking that grays and browns are bad or unwanted colors. I do not worry that much at all about colors mixing on my palette, or there being some leftover paint in my brush as I rarely need to use fully saturated colors in my paintings. The dull grays and browns do most of the work. It is important to note that no color is good or bad by itself. 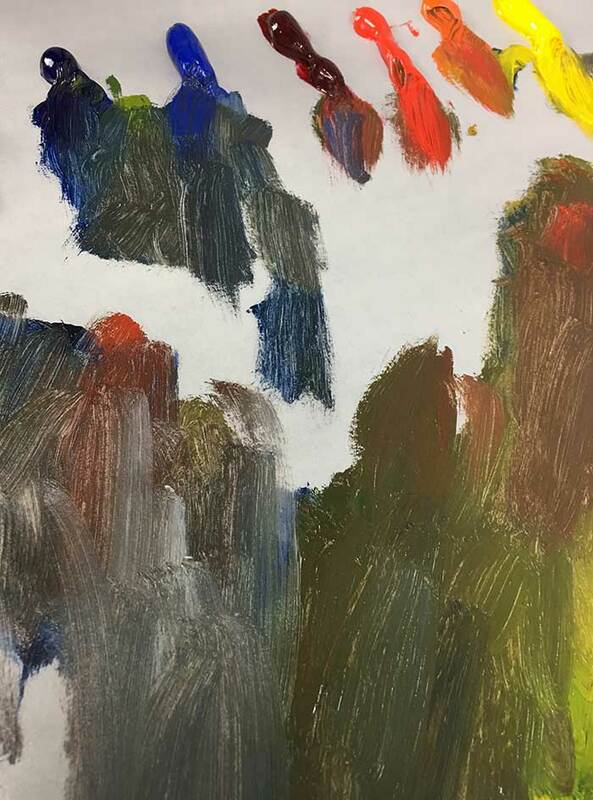 The only bad colors are those which do not make sense in the context of the rest of the painting - these are the muddy colors you should avoid. What Causes Your Colors To Appear Muddy? Muddy colors usually result from poor decision making or if you lose control of the colors on your palette. I find most of the time it is poor decision making which is responsible, when you don't really know what color you are mixing and you are just relying on guesswork. Color management on your palette is important, but not nearly as much as some artists make out. If you ever find yourself being unable to manage the colors on your palette, simply scrape down an area so you can restart your color mixing there. Below are photos of my palette during one of my paintings. It looks like complete chaos, but I understand what is going on with all the colors and it makes sense to me. This is still under control. A saturated blue under a very warm light source (this would look very out of place). A saturated red under a very cool light source (this would also look very out of place). A color with an awkward jump in value (for example, if you painted an area in the distant mountains darker than the foreground area). Colors which are too saturated/dull in the context of the rest of the painting. Going against the warm light, cool shadow (and vice versa) guideline may result in your colors appearing muddy. For example, using warm shadows with warm lights. Or cool shadows with cool lights. Use a limited color palette, as it makes it much easier to control your color mixing. Learn color theory, so that you can understand what color you need to mix rather than relying on guesswork. Don't worry about all your colors mixing on your palette, as long as you retain some kind of control. 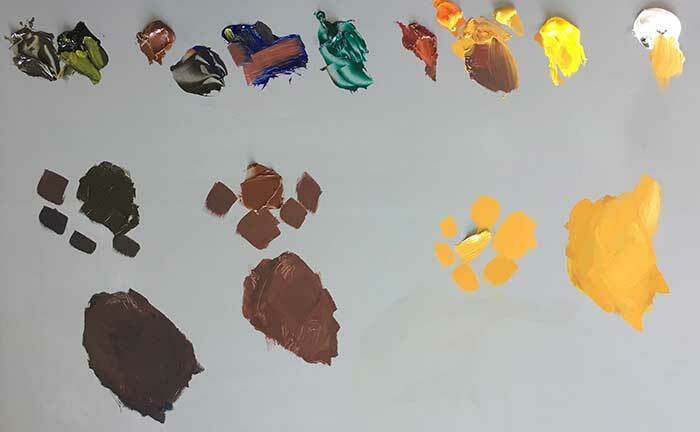 If you have lots of muddied colors on your palette and you need to use some more saturated colors in your painting, then all you need to do is scrape away a small area and place some fresh paint from a tube. Mixing the right color is only half the battle. You also have to make that color "work" with the rest of the painting. The right color in the wrong context is not the right color. 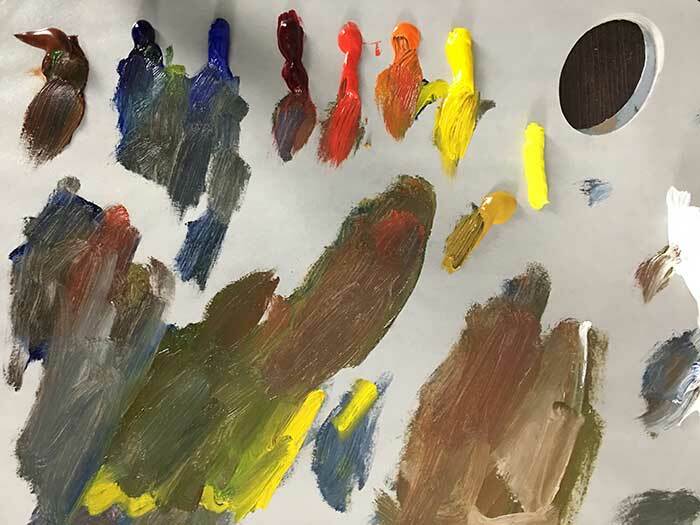 Thank you Dan for another excellent tutorial about mixing “muddy colors”. I am credit sharing your post on my Artist/Student/Facebook page. Continued best wishes for success teaching painting and drawing properly from the foundations on up. As a retired college art instructor your site is always my first recommendation! Thanks Dorine! Really appreciate the recommendations. Even if I paint with Water color, your tips are very usefull. Merci beaucoup. Thank you Dan, for all your wonderful posts. I have learned SO MUCH from you. I really am grateful! Thanks so much, Dan for teaching us step by step. I am reading all your tutorials and by diligently applying the advice you give in so many aspects, I am gradually falling in love with my work. I am a member of SouthAfricanArtists.com. If I now view some of my earlier work on my web, I can see that I could have done so much better had I only the insight now obtainable from your teachings. Looking forward to your tutorials.